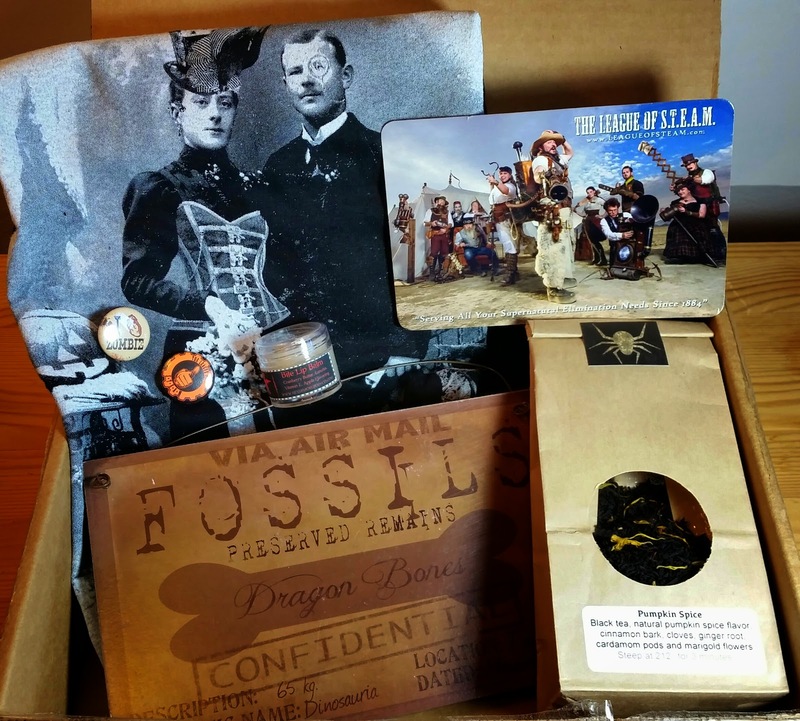 When I found out Clockwork Couture was doing a Steampunk subscription box, you can be sure I jumped right on that! I love Steampunk, though I'm not a complete fanatic, and a box of steampunk goodies sent to my door sounded pretty great to me. 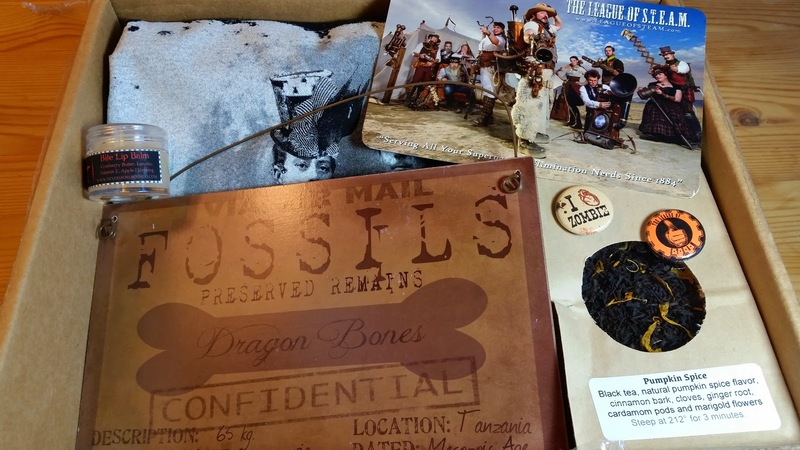 It was billed as having a T-shirt, tea and other items and while a T-shirt seemed an odd choice for a Steampunk Box, I rolled with it and signed up. If you love steampunk, you probably already know about Clockwork Couture. They have great costumes, clothing, accessories and doodads all related to the Steampunk genre. The Cost: $35/month, non-recurring. You must purchase a box each month if you want one. What You Get: In each box, you will receive an exclusive Tshirt in the size you choose, a full sized exclusive tea blend, a piece of art from a local artist, a sticker, and 1-2 additional items which will sometimes be jewelry, music, books, gifts or collectibles. 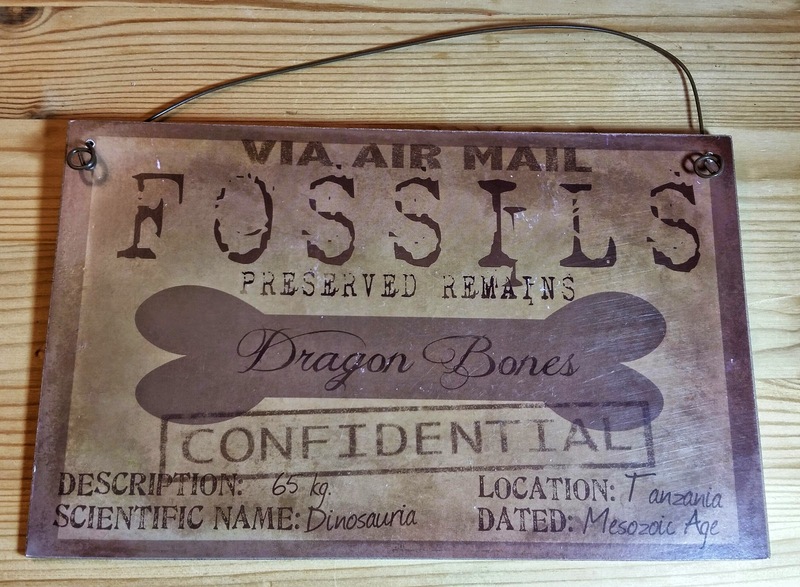 Dragon Bones Air Mail Metal Hanger/Magnet- I have no idea what this is related to or who made it or what it's actually called because there was no information card included in my box. This has a magnet on the back. I'll probably hang it up somewhere because... well, why not? It's a conversation starter at the very least. 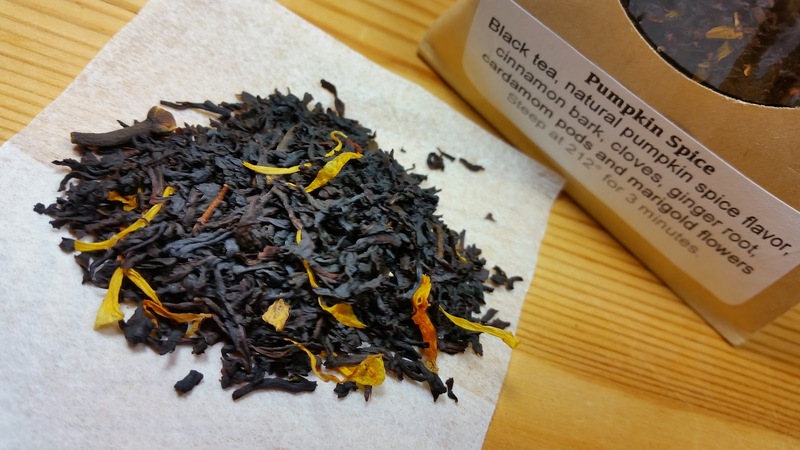 Pumpkin Spice Tea- Premium black tea from Sri Lanka flavored with pumpkin and exotic spices. Autumn festivities just wouldn't be the same without the comforting, smooth sweetness of spiced pumpkin - and neither would your tea time. Warm and rich flavor, with lingering cozy aromatics. I'm drinking this now and it's very creamy and caramelly, I really like it. Nevermore Body Company Bite Lip Balm in Cranberry Apple- Our little pot of lip balm is perfect for dry, cracked, chapped or thursty lips! Contains: Cranberry Butter, Lanolin, Vitamin E, Apple Flavoring. This smells good and works great. I like it. 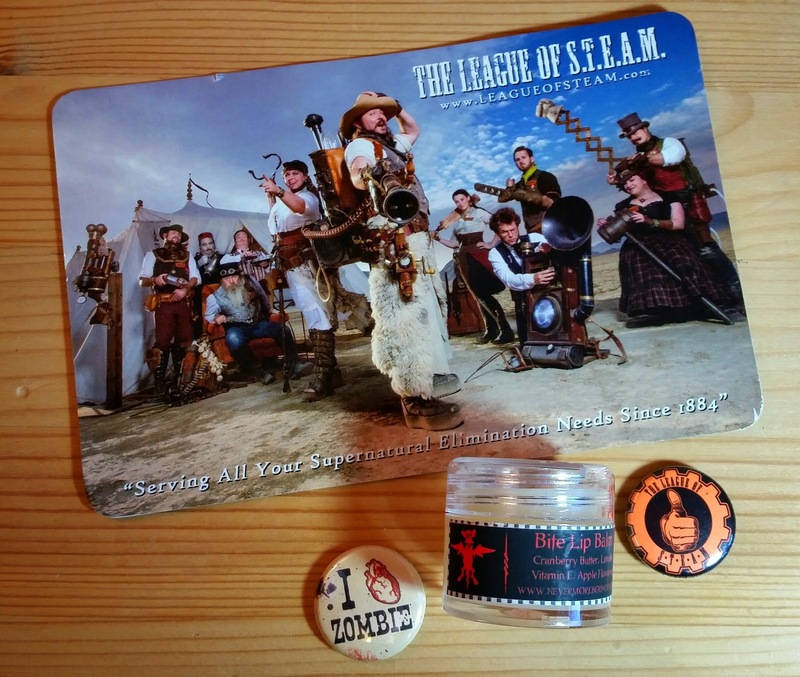 Tiny Button Pins x2- One says I heart Zombie and the other is another advertisement for the League of Steam company. I like the zombie one, that is cute but the other one? I didn't get a Clockwork Couture box for a bunch of silly indie theatre advertisements! 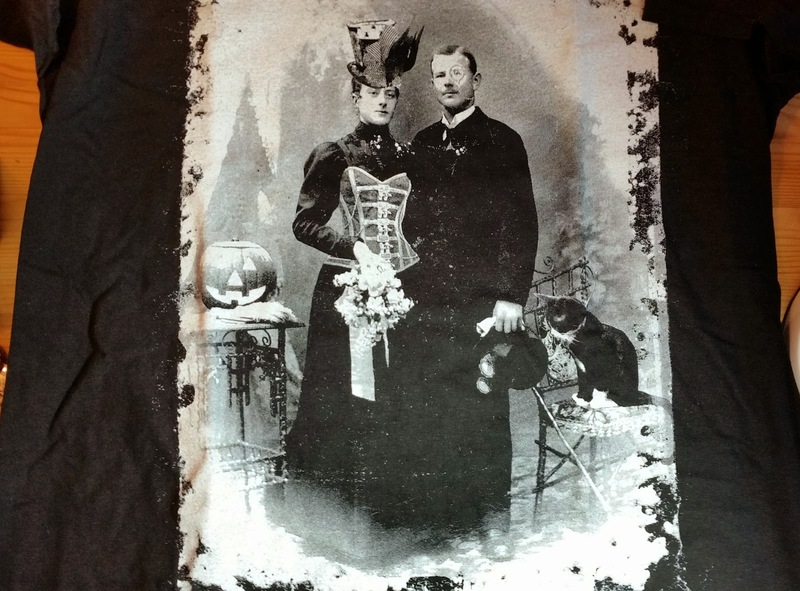 Clockwork Couture T-shirt- Maybe I'm not steampunky enough to know what this scene is. Maybe it's something super popular and I just don't know it. I just like reading steampunk genre books and wearing/looking at the clothing. I just cannot even begin to imagine why anyone would wear this particular t shirt. Ever. VERDICT: I wanted to love this subscription. I wanted to love it so much. Unfortunately, I am not impressed. The T-shirt is not what I was expecting (to say the least) and I don't even know if a true Steampunk fan would wear it. The tea is the best thing in the box, it is excellent. I do like the magnet/sign. That's cute. The lip balm is nice and I'll use it and the buttons are adorable, but none of it is really AMAZING. You know what I mean? For $35, I expect more. I expect a theme. I expect better curation. I expected an info card telling me what I've received and why. My suggestions would be to get rid of the T shirt altogether. It's unnecessary and isn't really Steampunk. I can't think of a time when I've seen a kitted out Steampunker in a T-shirt. Take the money normally spent on a T shirt and include more knickknacks. Like a bound journal or a coffee mug in an interesting shape. Scented candles or a candlestick. A set of gears to sew to a garment you already own. A knit cap. There are SO many better options than a T shirt. It would be worth $35 if that happened. Until then, I will not be resubscribing. This is a new subscription but I hope some kinks get worked out and the curation gets better. Clockwork Couture is amazing and sells some fantastic products. I'd love to get a better piece of that in this box. Once that happens, I'll be all over this box again. If you would like to subscribe to the Clockwork Couture Clockbox Steampunk Subscription, you can do that here. Otherwise, if you love steampunk, just check out their shop and drool/purchase something you can't live without. Eek. I think the only thing I really like is the sign, and I don't even know if that's really "steampunk" but really just cool-looking. My fiance is a purist when it comes to steampunk (he hates when people glue gears to things for example. He claims that all the gears should look like they have a purpose lol) and while I was tempted to get him one of these boxes, he's not really into tea, or lip balm for that matter, lol. On top of that, the shirt is just kind of odd. If someone is really into Steampunk or at least dressing in the style, they're probably not going to be into a shirt like that. They might have better luck teaming up with some etsy jewelry makers and doing boy/girl boxes, as some of the jewelry I've seen is really fantastic. Not the best start to this box, that's for sure. I am interested to see if it gets better, though! I'm glad it's not just me! I'm not a purist by any means (give me ALL the cliche!) but I was expecting SO much more :*( Totally agree with the Etsy idea. There is some marvelous stuff out there. I think they will always be including tea, which is fine by me because I like it but... Do you even know what this League of Steam is? Hmmm, this is an interesting box but I don't really see anything that screams steampunk to me past the design choices on the items. (but then again, font choice and colors can influence a lot). I'd say wear that shirt to garden since it's black you won't mind getting dirt on it! You should hang the sign on your fridge. (That's where I'd keep my dragon bones.) But yeah, t-shirts don't exactly scream Steampunk! A bracelet or something would have been better.